VbaDiff came about from my VBA programming experience. I found it frustrating to not be able to compare code from one version to another. VbaDiff was one of my first C# projects and a great learning experience. As soon as I have installed it, I have created two files (Test1.xlsb and Test2.xlsb) with some similar VBA code in them, in order to check the way the source control system works. 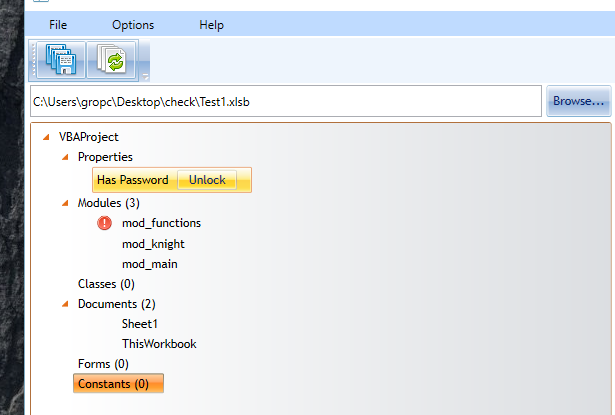 As you see in the screenshot below, it found immediately, that in the “mod_functions” the code is not the same in the two files and the “mod_added” is not present in “Test1.xlsb”. Then the challenge came – I had to select a Diff Tool from the list of the DiffTools. As far as I am always using GitHub and Git for source control, I have decided to choose the TortoiseSvn, as far as I was using TortoiseGit before 🙂 I installed it through the link and actually nothing happened… When I was thinking what is happening, I have simply decided to close the program and to open it again and then – voila – TortoiseSvn was recognized as an installed DiffTool. Not bad! Thus, I have selected the “mod_functions” and it opened through Tortoise, showing me kindly the two files with their differences like this. Looks great and useful – the first time I see a VBA a source control system, that actually works with VBA file! We can go even one step further – we may change the files in the Tortoise (Or whatever diff tool you select from the list) and to write them back to the VBA file. In this case, you may see the small asterisk, at the end of the module, that is going to be changed – in this case “mod_functions*”. After clicking the “save” button changes are saved. 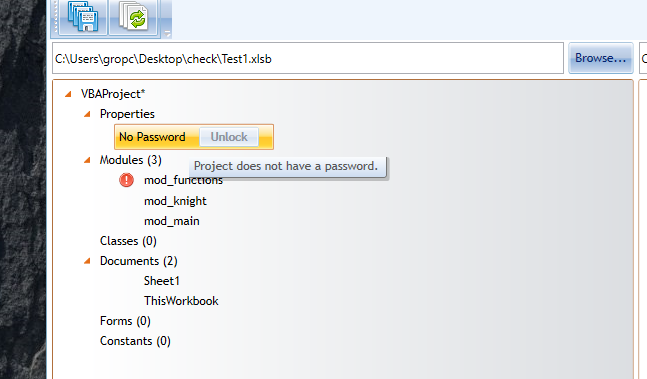 Just one click was needed to remove the password (actually I was already expecting it, as far as it had already showed the modules and their code in the password protected worksheets). The last useful feature of VbaDiff, that I would note down is the automatic export option of VBA to a disk. Really useful, if you want to share your progress with another developer in a team, without sending the Worksheet. Thus you may use GitHub or other source control, exporting to a git-shared folder. The trial version of the tool is available here.